NoBo vs SoBo PCT Thru-Hiker – What’s The Difference? 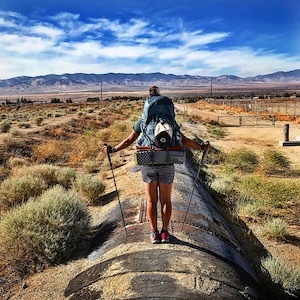 In 2018, I chose to hike the Pacific Crest Trail as a NoBo hiker, starting my thru-hike at the southern terminus on April 25thand completed my hike at the northern terminus on September 27th. Even though there are plenty of pros and cons for hiking in both directions, I plan on completing my second PCT thru-hike in 2019 again as a NoBo hiker. NoBo or Sobo – Which way should I go? Weather will dictate a NoBo’s “enter the Sierra” date each year, which is usually not recommended to be before June 1st. If it’s an average to low snowfall year, most hikers will aim to be at Kennedy Meadows South (Mile 702) between June 10thand June 15th. Once in Washington, NoBo hikers should aim to have their hike completed before the first winter snow falls in the North Cascades, which tends to be by October. Winter storms have been known to happen as early as mid-September. Once the snow starts falling in this area, hikers risk hypothermia, avalanche hazards, and a snow-covered trail that’s extremely difficult to follow. Weather also plays a significant factor in when SoBo hikers start and finish their PCT thru-hike. In general, most SoBo hikers aim to start their hike from the northern terminus between the end of June through the end of July. Start dates for SoBo hikers always depend on the amount of leftover snow/snow melt from the previous winter in the North Cascades and the new snow coming for winter in the Sierra. Once on trail, SoBo hikers generally aim to cross over Forester Pass (Mile 779) by mid-September and reach Kennedy Meadows South (Mile 702) by late September/early October because the first significant snowfall in the Sierra tends to happen in early October. From here, SoBo hikers typically complete their hike at the southern terminus by mid-November. NoBo hikers tend to experience warmer weather along the PCT. At times, the weather can even be unbearably hot in Southern and Northern California. By the time most NoBo hikers reach Washington in the fall months, the weather can turn from warm to cold, rainy and snowy literally overnight. There tends to be a longer and safer weather window for NoBo hikers along the PCT lasting 3.5 months as opposed to only 2.5 months for SoBo hikers. SoBo hikers aren’t affected by the summer heat like NoBo hikers are in Southern and Northern California, but SoBos do have to be concerned with weather when it comes to starting their thru-hike. Conditions of the trail in the North Cascades will depend on the snowfall from the previous winter. It it’s a heavy snow year, SoBo hikers should anticipate a fair amount of snow travel at the beginning of their hike through the North Cascades. Not only can travel on trail in this section be challenging for hikers, but so can accessing the trail. During heavy snow years, the road to Harts Pass (where most SoBo hikers initially access the PCT from) could potentially be closed through the end of June, potentially causing hikers to start at a later date. NoBo hikers have the advantage of using the first 700 miles on trail to get their trail legs and get in shape before reaching the Sierra. SoBo hikers don’t have the same training opportunity. Right out of the gate, SoBo hikers are faced with traveling through some of the roughest terrain on the PCT such as steep and dangerous slopes, sometimes covered in snow and often times without footprints to follow. These conditions may require a SoBo hiker to have mountaineering skills in order to navigate through the beginning section of the trail safely. NoBos tend to have more access to water in Southern California than SoBos do. In the spring, water sources are more likely to be flowing in Southern California than they are later on in the year. Even though as a general rule of thumb, hikers should never rely on water caches, most caches in the desert tend to be stocked during the spring and summer months. The PCT Water Report is also frequently updated with new information from hikers passing through the area. Many Southern California water sources dry up in the fall, making it hard for SoBo hikers to access water on trail in this section. Water caches in the desert may be closed or tend to be empty during the fall and early winter months. Even campground faucets could be shut off for the season by the time SoBos reach this section. Often times, the PCT Water Report is not updated after the end of June, once the majority of the NoBo hikers have passed through the area. SoBo hikers will need to plan well and be prepared to not have access to a lot of support and very little up-to-date information provided by other hikers. Most of the popular resupply stops and trail angels are open to NoBo hikers, as long as they don’t start too early in the season. Trail angels and town stops along the PCT are often available during the peak times of the hiking season to help provide thru-hikers with being able to pick up packages, eat, resupply, shower, laundry, overnight lodging and providing rides to and from the trailhead to town and back. NoBo hikers also get to experience a majority of the trail magic provided along the trail. They also get to experience the social aspect of the trail with over 1600+ hikers doing the same thing. Travelling with the herd of NoBo thru-hikers means trail towns will be busy and many of the tentsites could be occupied. For SoBos reaching many of the Sierra resupply stops later in the season, they risk reaching some of the town stops and trail angels by the time they’ve closed for the season. NoBo hikers have no problems crossing the Canadian border from the US at the northern terminus and continuing onto Manning Park via the PCT as long as they have a Canada PCT Entry Permit. For SoBo hikers, traveling southbound from Canada into the United States becomes a logistical problem because its illegal. SoBo hikers must hike to the northern terminus at the US/Canadian border within the United States, often accessing the PCT via Harts Pass. Once at the northern terminus, SoBo hikers will have to continue their thru-hike south on the PCT. Due to US Customs and Border Protection regulations, permits are not issued starting in Manning Park, Canada. SoBo hikers wanting to start at the northern terminus will need to receive a permit stating they’ll be starting at the US/Canada border instead. SoBo hikers can apply for a free PCT long-distance permit in January through the Pacific Crest Trail Association. When hiking SoBo along the PCT, there are usually less than 100 other hikers heading in the same direction. This makes for a much more solo and less social hike, ideal for someone looking for more solitude along the trail. People who often travel SoBo along the PCT are hikers looking to start their hike later on in the season once school gets out in late June, making this ideal for students and teachers. Also, for those who are prone to bug bites (such as myself), SoBo hiking is also ideal because there are far less bug problems. Central California and Oregon are infamous areas along the PCT where NoBo hikers tend to experience awful encounters with mosquitos and bees. The direction a thru-hiker decides to travel in along the PCT will depend greatly on the type of hiker they are and the type of hike they want to hike. Everyone hikes their own hike along the PCT no matter which way they’re headed. Pingback: Meanderthals | NoBo vs SoBo Pacific Crest Trail Thru-Hiker – What’s the Difference?